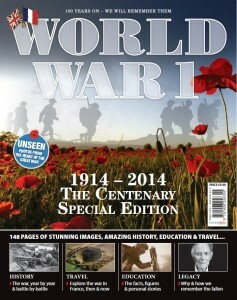 To mark the centenary of the start of World War 1, France Media Group has produced this special edition publication – 148 pages of stunning images and amazing history. This publication mixes history with travel, exploring both the archives and the world around us today, to see how we can experience World War 1 here and now. The narrative follows the timeline of the 1914 to 1918 war, from the first, short-lived battles on the outskirts of Paris to the brutal war of attrition in the trenches. We explore four key themes and regions en route; war in the city, the British HQ along the northern coast, the Somme and Verdun. The edition combines history and travel with facts, figures and human stories – all brought to life by modern, world-class photography from Mike Sheil and rare images from the archives at the Musée de la Grande Guerre in Meaux. We are proud to have this opportunity to pay our respects to the generation of men and women who lost their lives in World War 1. We will never forget them. This publication can also be found in WH Smith. Educational Institutes and Commercial Partners – contact us.